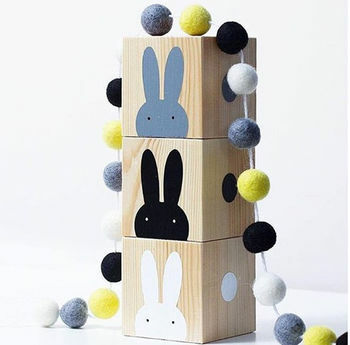 Lovingly handcrafted wooden play and decor pieces for babies and little ones. Influenced by my two little kids and inspired by the beauty of wood, 'Myla & Oscar' was created when I was reminiscing of tent building as a child with chairs and my mother's washing airer. Unable to find a cool and modern design (that didn’t come with a huge international shipping tag) I decided to make my own tent and quickly realised others were looking for the same. So with the help of my father (a professional carpenter) and my sewing-loving mother, I created my own range of Play Tents, sourcing fabrics and designing my own, which were on-trend with the modern mummy of today. 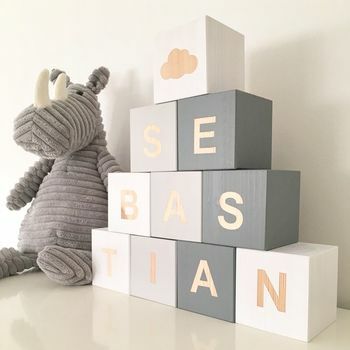 The brand grew quickly as I delved deeper into the world of little ones decor and I created the Play Cubes - hand cut and sanded wooden cubes that could be painted bespoke. They were hugely successful and featured in Tatler Magazine’s Christmas Gift Guide in the opening year. 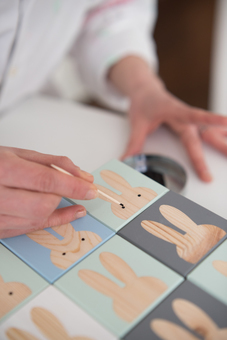 They have continued to grow in popularity and these handcrafted wooden blocks are now stocked in the new baby department at London's Fortnum & Mason, within the luxury marketplace NOTHS and a few select others. 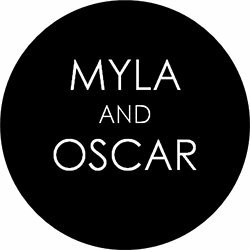 Having worked in the PR and Creative industry for 10 years, my head is buzzing with new ideas and products that I cannot wait to design – products I know Myla and Oscar would love and that are a little different, cool and fun. 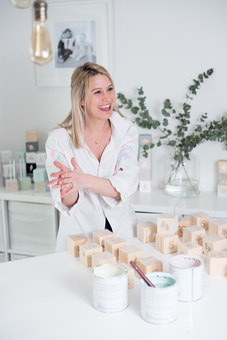 "Gorgeous product, super friendly seller and a pleasure to do business with. Many thanks A++++"
"I was totally delighted with my purchases and will definitely be back for more in the future. I thoroughly recommend the quality of the wooden cubes, and the speed with which they reached me. 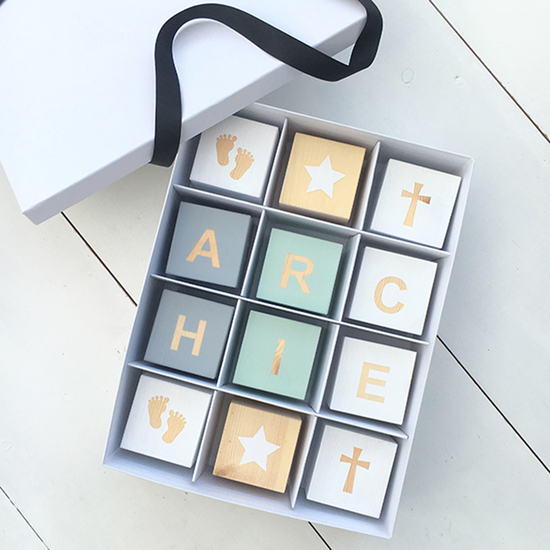 I contacted the maker when my cubes arrived to express my appreciation and gratitude." 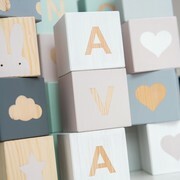 "Absolutely beautiful and would recommend them to anyone thinking of buying them for a baby/child's nursery or bedroom. Very very pretty"
"We had these made for a joint christening and we're very happy with the service which was quick and efficient and quality"
"PRACTICALLY PERFECT Products to fill your children's rooms with convenience and colour"
"VERBIER A round up of all things luxury this Christmas"
"HOW TO TREAT THE COOL KIDS IN YOUR LIFE? 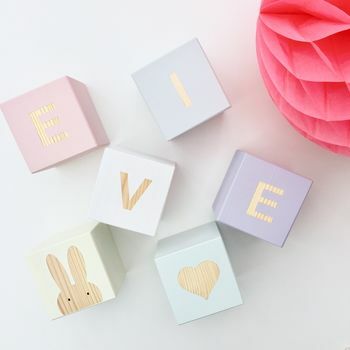 ...the most stylish, original and smile-worthy gifts"
"THIS MONTH WE LOVE: MYLA & OSCAR The building blocks are great for play or decoration."